Addressing the needs of all persons with mental illness is important. But it’s even more critical to address the complex challenges of children and young adults who are facing mental illness, to ensure that their futures remain hopeful and full of possibility. At Thresholds, the Mothers Project and Young Adult Program are working to coordinate services and care for some of our most vulnerable populations. This week, while people across the nation come together and focus on addressing the need for comprehensive mental health services for children, youth, and families, we salute the work of these fabulous programs and the courageous members we serve. To be connected to an event near you, visit SAMHSA’s website. Read Anais’s story, a member of the Mothers Project who found new direction with the help of Thresholds’ staff. Hear from Calvin, a young adult who found work and educational opportunities after working with the Thresholds Young Adult program. 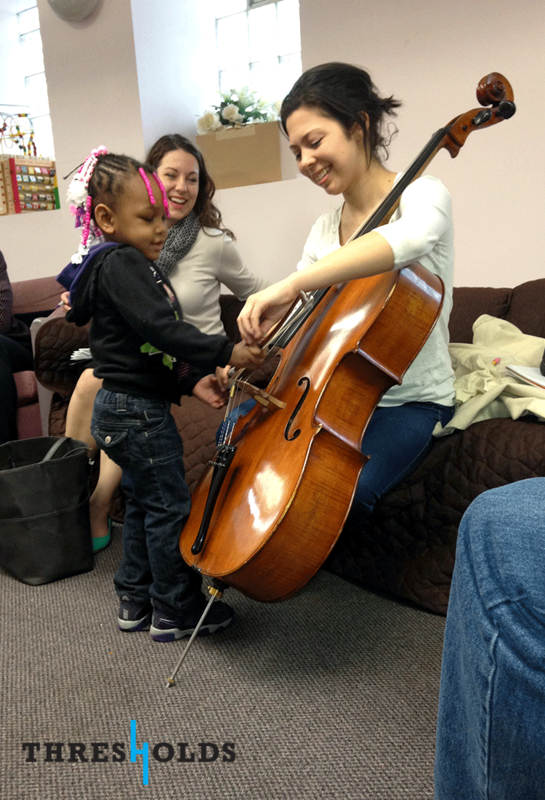 Check out photos of the Mothers Project with the Chicago Symphony Orchestra participating in Carnegie Hall’s Lullaby Project, where young mothers had the opportunity to write lullabies for their children alongside world-class musicians. If you’re interested in supporting Thresholds’ advocacy efforts to ensure that Illinois maintains appropriate funding for vital mental health programs like these, please consider joining our advocacy mailing list to stay up-to-date on action alerts and advocacy opportunities. This entry was posted in News and tagged awareness, Children, healthcare, mental health, Mental Health Month, MHM2014, MHmonth2014, Monthers, National Children's Mental Health. Bookmark the permalink.